Sugar Shack Donuts – Free donut today with proof of military ID or picture in uniform. Cafe Caturra – We would like to honor our Veterans and current service men and women by offering a FREE entree to military personnel tomorrow, November 11. Chick-fil-A Parham Road – Thank you to every man and woman that has put their life on the line for our freedom! Please come in for a free entree of your choice so we can show our appreciation! Chick-fil-A Short Pump – Free Chicken Sandwich to honor our Veterans on Monday, November 11, 2013 from 10:30am-10pm. Please show Military ID when placing your order. Chick-fil-A Chesterfield Towne Center – With humility and gratitude we are offering all Veterans a FREE Chick-fil-A Chicken Sandwich when they mention this offer. Thank you for your service! 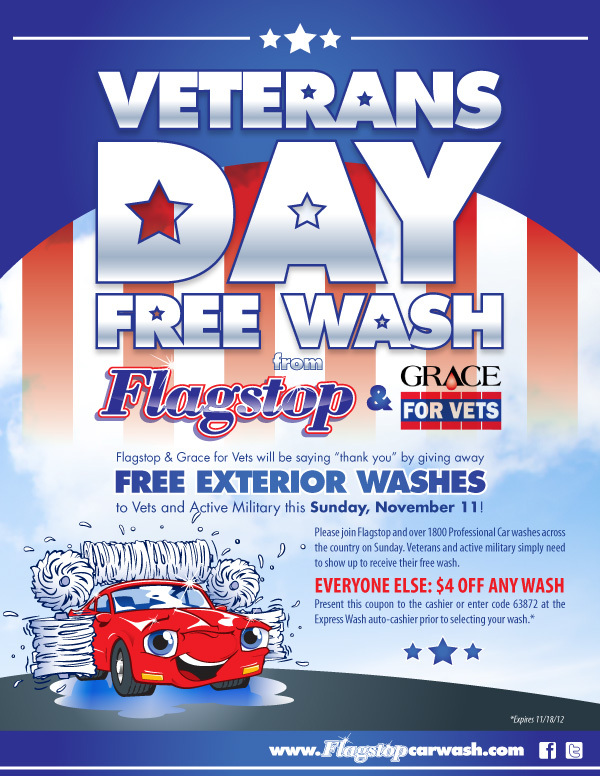 Dairy Queen Tuckahoe Village – Happy Veteran’s Day!! Thank you for your service. Come by today to receive a FREE SMALL CONE OR CUP if you have served or are currently serving in any branch of the military. Lift Coffee Shop & Cafe – The coffee is on us today Veterans…Thanks for your service! Colonial Williamsburg – Active duty military, reservists, retirees, veterans, and their dependents receive free Colonial Williamsburg admission for the entire Veterans Day weekend—November 8–11, 2013. (Discount) Wine Loft RVA – The Wine Loft would like to salute all of our Veterans, not just today, but everyday. A group of people who are and have been willing to pay the ultimate sacrifice for our Country, and for you. Today we raise a glass in your honor. Come in today and receive half off your bill as a sign of appreciation! Veterans eat for free this Friday, November 11, as many restaurants honor their service with special Veterans Day offers. 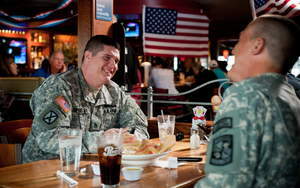 Applebee’s – Choice of free signature entree for veterans and active duty military. Offer is valid for dine-in only. Traditional sides are included with the free entrees. Chili’s – Free entree from 11am to 5pm Friday. Choose from a menu of 6 options or any lunch entree. Famous Dave’s – FREE Two Meat Salute on November 11. Choose two different meats served with corn bread muffin, corn-on-the-cob and your choice of one side. Chick-fil-A Short Pump Crossing – Free Chick-fil-A Chicken sandwich meal for veterans with ID from 11am to 8pm on Friday. Ask for the Veteran’s Day Special. Colonial Williamsburg extends a free admission offer to members of the military this weekend, November 11-13, with “Honoring Service to America” tickets. From Friday through Sunday of Veterans Day weekend, Colonial Williamsburg offers free weekend-long admission tickets to active-duty military, reservists, retirees, veterans, and their immediate dependants. The “Honoring Service to America” ticket provides admission to Colonial Williamsburg exhibition sites, art museums, and most daytime programs. It also includes free parking at the Colonial Williamsburg Regional Visitor Center, access to the short movie Williamsburg—The Story of a Patriot, and complimentary use of Colonial Williamsburg shuttle buses. Thank you to my father-in-law, numerous friends, and everyone who has served or is serving to protect our country!